Bonjour for one last final post as my France adventure draws to a close. Since my main objective of the internship was to fully understand the concept of terroir and how the farm incorporates value added agriculture in the form of tourism, I am going to elaborate once again on these concepts now that I have actually had field experience (and can understand a lot more that is said to me in French!) My internship has been absolutely amazing, and I strongly encourage anyone looking for an internship next summer to abandon their paid, somewhat normal internship offers for an unknown adventure (thank you Cornell Tradition for making this opportunity financially feasible.) 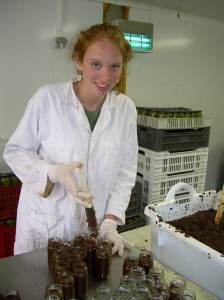 I had the chance to do so much ranging from planting olives trees, sorting olives, bottling olive oil, packaging, guiding tastings and giving farm tours in French. I also had the opportunity to meet with research professors, local producers, and government officials to learn about agriculture policy and consumer trends. 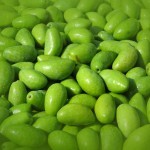 It is clear that the olive farm gives added value to their product from the standpoint that their quality is so high. 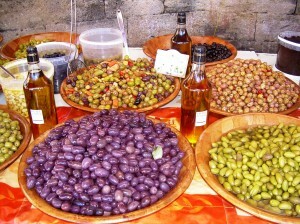 In addition to this, value addition is given based on the fact that their product line is so unique due to their cosmetics, flavored olive oils, olive spreads, and their extensive use of heirloom varieties of olives. 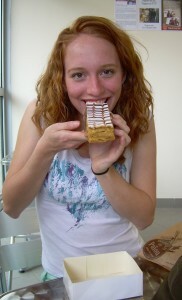 Needless to say, I truly enjoyed my French experience. It is nearly impossible to achieve a complete understanding of French agriculture, but I tried to learn as much as possible, and I can definitely say that I successfully pursued French desserts. Thanks for reading-merci and au revoir! Today, I was able to discuss the consumer trends of olive oil with everyone on the farm, and learn more about the clientele base of the farm. Olive oil is experiencing a dramatic surge in popularity. The farm has noticed that customers are now especially concerned about the health of the environment, and their own personal health. Olive oil has a good image, thanks to the heavily scrutinized Mediterranean diet, and is rich in polyphenols, Vitamin E, and monounsaturated fatty acids. I am indulging myself in the olive oil, as after all, I am somewhat near the prime location of deviation for Ancel Key’s Seven Countries study findings. The study found that serum cholesterol levels were strongly associated with coronary heart disease everywhere, but particularly, not in Southern Europe. 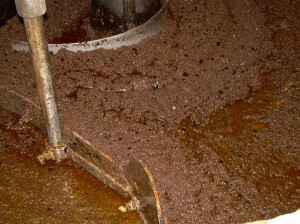 Could this be the “healthful” fats of olive oil at work? The farm hopes that by going organic, they will further project their image of being healthy for both the body and the environment. 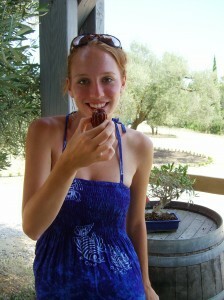 A paper by T. Michels (2006) identified six consumer profiles for olive oil, which I thought was very noteworthy. The paper describes the “the foodie, the aspirational foodie, the recipe reader, time poor foodie, time poor aspirationals and the uninterested.” Michels also points out that consumers do not really know about olive oil, or various ways to use it. I somewhat agree with this even though in the US, Rachel Ray and others are always proclaiming their love for Extra Virgin olive oil to the public masses. 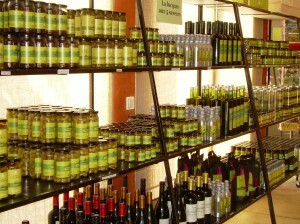 Here, even though this is the south of France, and not the larger Spanish or Italian olive oil production areas, it is difficult to find a product which does not use olive oil. In addition to consumer trends, it was interesting to learn the break-down of the sales on the farm; an incredible 70% is sold directly from the on-site shop. The shop is only 10 minutes away from Montpellier, a very large city, and attracts wealthy clientele since the product is of a very high quality and is labor intensive. 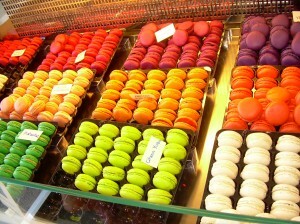 Besides location, I think the store has such a good turnover because the whole experience is very personalized. 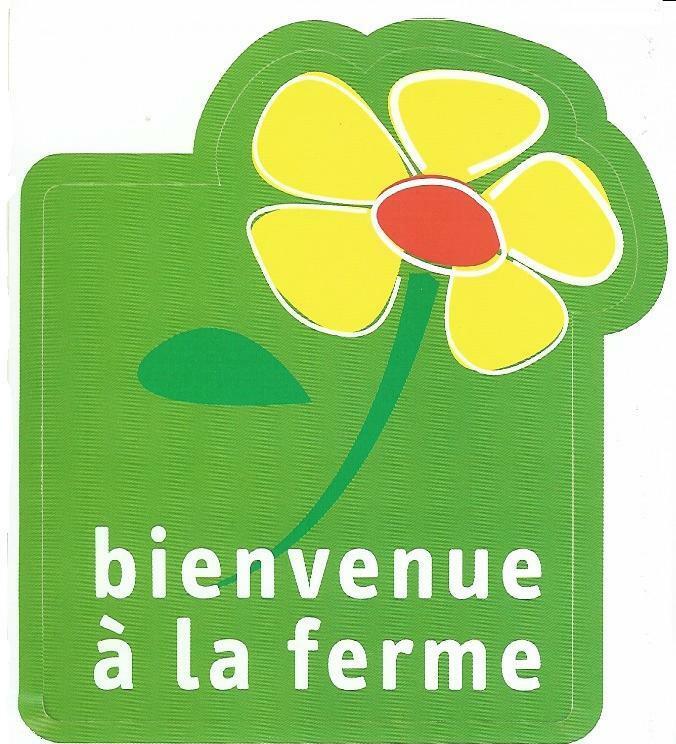 As soon as a customer comes through the door, they are greeted with a “Bonjour!” and if desired, are educated about the various products of the farm, which includes a tasting. I have taken part of this process many times as both the taster and the informer, although I do have to admit, usually I am the taster. Exportation is a new feature for the Domain, and results in 5% of sales. Apparently, it is harder to export to Asian markets since olive oil is not as widely used in their cuisine, but northern Europe and North America are turning out to be important customers. For example, we just prepared a large order to send out to Canada. The remaining 25% of sales results from restaurants and local boutiques that carry the Domain’s products. I have mentioned such boutiques when I discussed the “Maison de Producteurs” organization in the last post. 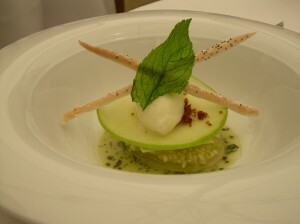 Along the lines of selling to restaurants, this week was definitely one of the highlights of my entire internship. 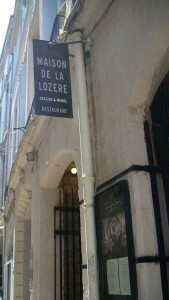 I had a chance to visit Maison De La Lozere, a restaurant that the Domain de l’Oulivie almost exclusively supplies (http://www.celliermorel.com/). 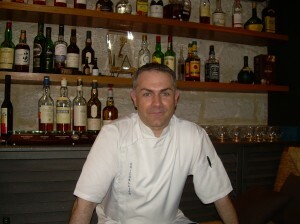 I was able to eat, see the kitchen, and interview the chef, Eric Cellier. This is definitely my favorite kind of learning experience! A paper by Abel Duarte Alonso dealing with olives and tourism describes how when restaurants carry local olive products, it increases the interest of customers, and acts as an incentive to attract customers to the olive farm or to buy the farm’s products. From my visit to the Maison De La Lozere, I understand how this can be true. The restaurant displays the various oils they use from the Domain in a gorgeous glass case for customers to see when they first enter the restaurant. Also, the chef has worked extensively with my boss at the farm to blend his own special oil using two varieties, and a special black bottle which was designed exclusively for the use of the restaurant. 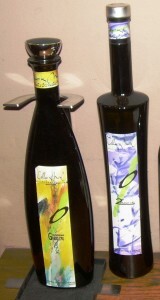 After select customers dine, the chef offers them little vials of the olive oil to take home as well. The oil is used in the classic style with vegetables, meat, and fish, but is also used to make marshmallows, and ice cream. I know I have previously mentioned the Common Agriculture Policy, known in France as the Politique Agricole Commune, when I initially underwent the French agriculture policy crash course at SupAgro University. However, now that I am on the olive farm and have discussed with my hosts the role of public policy on the daily financial operation of the farm, I have a definite renewed interest. If the thought of policy makes your eyes glaze over, I will try to intersperse pretty pictures from the farm throughout my policy spiel. Here’s a quick description of the PAC as I understand it… Originally, the PAC was focused on the objective of increasing food production since food security was a postwar issue. Farmers were given grants and subsidies for excess food produced. By the time the 1980’s rolled around however, the opposite, food surplus, was now the problem. The policy’s aim of creating food security worked too well. The French refer to it as being a “victim de son success.” Thanks to large reforms in 2003, grants are now given to farmers independently of amount produced to avoid the problem of a food surplus. There is still income from the government through subsidies, but for example, instead of subsidizing for quantity, grants come to farmers for aspects such as sustainability and food safety practices. The farmers are free to produce whatever is most profitable for them by following market demand. I’m almost done with the simplified policy lecture here, but I do have to point out my favorite aspect of the PAC in relation to France. I find it so interesting that out of the whole EU, France gets the most money from the PAC-a whopping 42.7% even though they do not contribute the most money to the European Common Budget. Obviously, this is a source of great debate for upcoming revisions to PAC, but it just goes to show how important agriculture is here in France. The Domaine de l’Oulivie gets such grants from the national government, the EU, and the Region, especially since the farm is working on developing themselves as an organic farm. Still, because olive growing makes up only .1% of the agricultural products produced, it is not given financial priority in relation to the PAC budget. 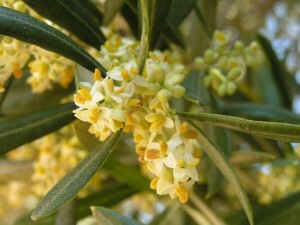 To combat this, growers have united under AFIDOL, Association Française Interprofessionnelle de l’Olive. 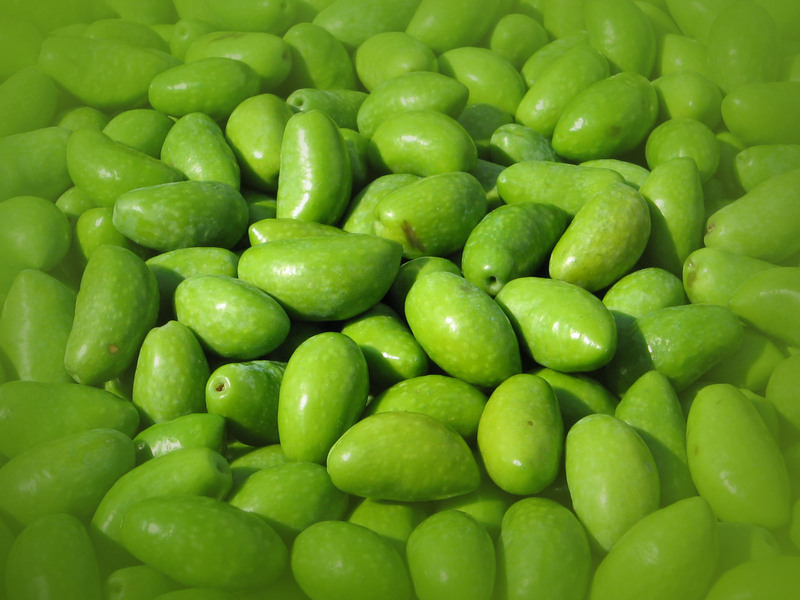 It is a professional olive association which includes 30,000 growers, 30 confectioners that use olives in their products, and 18 olive nurseries. In addition to having power to petition for government funding, the association assists French olive growers, such as the Domain de l’Oulivie, by providing technical knowledge specific to Mediterranean olive growing. It is fantastic that there are so many organizations to assist the smaller farmer in a financially viable manner here. The farm belongs to several organizations which help market their product. 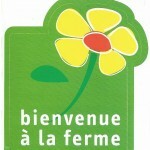 One example is the French Agriculture Board’s Bienvenue a la Ferme, which is a membership program to promote regional products. For only a small fee, the farm receives publicity such as road signs. The farm also markets their products with a Qualite Sud de France label which is an association created by the Languedoc-Roussillon Region. The products are described as “coming from the soul, heart, and taste buds.” Most importantly, the label creates a brand identity that links local products to a market, and is a mark of quality for the customer. The newest organization for the Domain de l’Oulivie is the Maison de Producteurs, which is a group of producers with boutiques that sell each other’s products. I have found my official favorite dessert of all time, and as promised, I am posting information on how the Domaine de l’Oulivie integrates value added tourism into their products to diversify themselves from competitors. 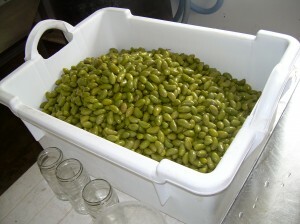 Also, since I will be leaving before the olives are ripe, I was able to obtain pictures of the harvest from the Domaine de l’Oulivie, for everyone’s viewing pleasure. I had mentioned the trees flowering in previous blogs, so it is nice to now have images. While at SupAgro University, we had a chance to meet with professor Fatina Fort to discuss her research on consumer perception of terroir products. Our discussion was fabulous for helping me understand value added strategies used by producers, some of which I am now witnessing at the Domaine de l’Oulivie. She pointed out that in order for farms to succeed, there needs to be producer motivation, a market for the products, and an image that consumers can have about the producers or the region that is reflected in the product. She discussed strategies for producers such as quality and market segmentation, how to create added value, and what is needed to construct the “terroir/origin effect” on the consumer. The Domaine de l’Oulivie adds value by integrating and inspiring tourism. They have a quaint shop so there is an outlet for direct selling from the producer, and they welcome the public with activities such as festivals, and tours of their museum. To further diversify from competitors, the Vialla brothers have planted heirloom olive varieties collectively called “Grand Crus,” meaning that the cultivars are all local varieties, no more than 300 trees are planted per hectare, and no more than 4 liters of oil per tree is harvested. 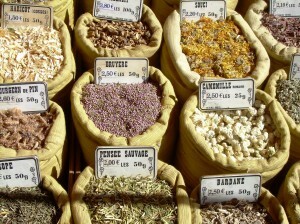 The older varieties are unique in the market and embody the region, a crucial element of success as discussed by professor Fort. 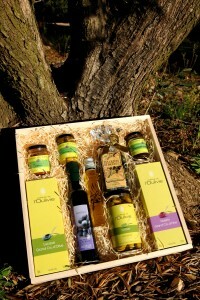 For example, the Farigoule variety is olive oil blended with herbs that grow in the Garrigue, the local natural vegetation. According to the legend, olive oil producers “back in the day,” would add herbs of the Garrigue to the last pressing to sterilize or clean the pressing equipment. They would keep this last “inferior” herb tasting olive oil for themselves. The Domaine de l’Oulivie now routinely adds herbs to their oil even though the process is modernized and does not need the traditional herb sterilization. So far, it is one of my favorite oils and I have even had the chance to bottle it! The farm is also going organic, which means they can have an organic label AB, or in French called Agriculture Biologique, which will be on the products. There are some policy disputes about this as organic laws are becoming standardized across the EU. Despite this, this is the first year that the Domaine de l’Oulivie’s products will be carrying this label. This is a definite added value strategy since an organic label will open up the market and command higher prices. 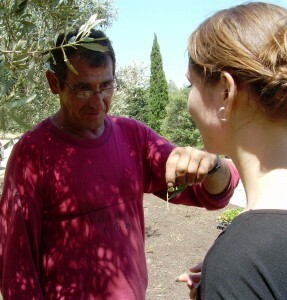 I inquired about the major complications of the olive farm to learn more about this whole value-added tourism aspect, and apparently going organic is a definite hassle despite its eventual rewarding outcome. 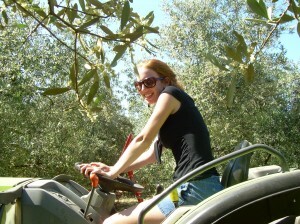 Since no herbicides are used, the farm employs two cows and two horses to mow and fertilize the olive groves. 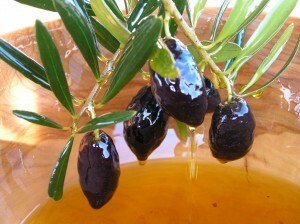 Also, the olive tree’s major enemy is the olive mouche, a fly that normally would be easily controlled by pesticides. 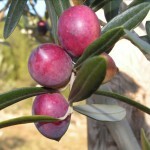 Instead, the farm sprays the ripe olives with clay which turns the olives white so that the fly does not recognize the fruit as egg laying territory. Unfortunately, this clay comes off with the rain, what little rain they usually get here, and is more expensive. Finding new clients can be problematic, but the new organic label is projected to attract a new customer pool. I love France and feel that I am learning so much here from so many vantage points! In my next posts, I will discuss how agricultural policy makes this type of operation possible, olive oil consumption trends as they are observed by the Domaine de l’Oulivie, and any other adventures I have on the farm. 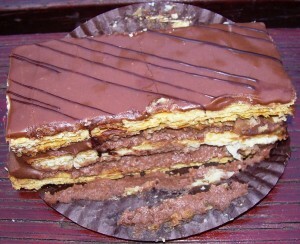 In the meantime, feel free to savor this picture of deliciousness, it is chocolate MilleFeuille which translates to mean a thousand sheets since there are so many layers of heavenly pastry. 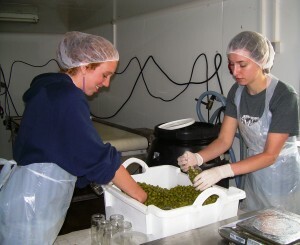 Bonjour from a very busy week at the olive farm! I am now experiencing the Domaine De l’Oulivie savoir-faire, or the traditional “know how” of various olive product processes firsthand. Since I elaborated on the museum aspect of the farm in my last post, I think information on the modern equipment and processes will show a nice contrast. It depicts how here in France, they have the modern equipment, but also strong ties to the past and constant reminders of tradition. We will be leaving in July, so I will not be able to witness the big gather, but from what I’ve learned so far, there is so much work here that is done manually! 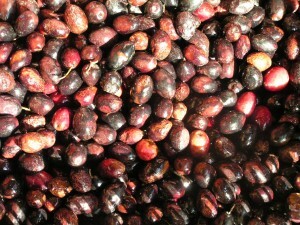 The green olives are picked by hand so that they do not bruise, and then half are left on the tree for three more months to turn black. They shake the branches with something that looks like an upside down weed whacker called “combs” so that the black olives fall to the ground onto tarps which are then gathered up and emptied into bins. 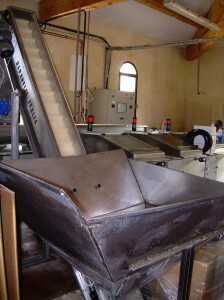 The olives, green or black and with their pits included, are put into the machine below to get ground up. 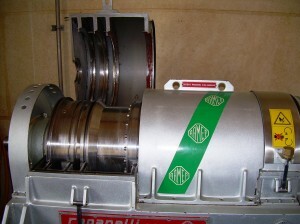 The next machine further mixes, which is especially beneficial for tapenade and purees. 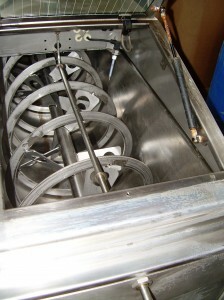 In the last machine pictured below, the oil and water is separated out of the mixture. 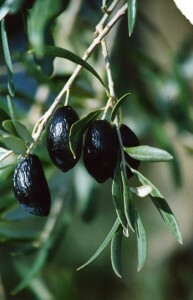 During July through September, the olive fruits continue to get bigger with sun and water. 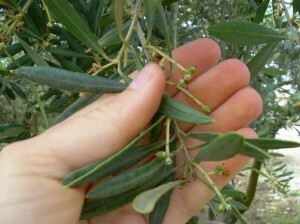 As of right now, it is possible to see tiny olives forming-so exciting! The flowering of the trees depends on the temperature, and usually lasts two weeks. We caught the tail end of this process when we first arrived in May. I could not believe how much pollen there was, but this is probably explained by the fact that the trees are wind pollinated, not insect pollinated. We actually planted some baby olive trees, as shown below, but most of the trees on the estate are around fifty years old. 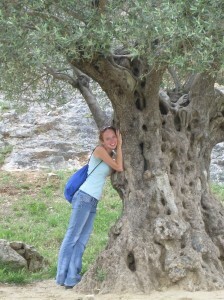 It was also very interesting for me to plant baby olive trees this week, because on the weekend, we ventured to the Pont du Gard, where there is an olive tree that dates back to 908 AD. 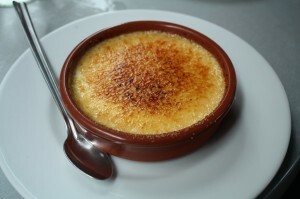 I know this is not a travel blog, yet I cannot help but suggest that anyone who ventures to the south of France needs to see fireworks off of the Pont du Gard and try a Tielle, a traditional southern France seafood pie that I adore. Unfortunately, I just learned while attempting to research the appropriate spelling of this seafood pie that it is made with garlic, tomatoes and squid. I’ve been eating squid this whole time-agh!! 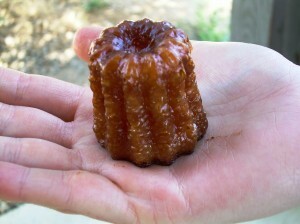 Oh well, it’s delicious and I will probably still eat one every chance I get! Anyway, back on topic… I love the aspect of tradition embodied here. The Domaine De l’Oulivie even manages to incorporate tradition into their marketing strategy to differentiate themselves by growing heirloom olive varieties, one specifically is called Violette de Montpellier which produces absolutely divine tasting, strong flavored, olive oil. My next post will be dedicated to this interesting concept of how the farm integrates value added tourism to diversify their products and differentiate from competitors. So I wonder how many of the olive trees I planted will live to be 1000 years old? The olive farm has been in the Vialla family for three generations, and has about 30 hectares of olive trees. They grow three main varieties that are well adapted to the hot dry summer weather, which I will detail later. They employ 8 people year round, and more during the harvest season. One of the best aspects of the farm is the fact that they uphold tradition and continue to demonstrate to their clients the “traditional” way of making olive oil through their museum. In fact, for my first weekend on the olive farm, I was lucky enough to be able to witness the spring open house, Le Printemps Des Oliviers, where a demonstration of making olive oil the “old school way” was available to tourists, the general public, and clients. 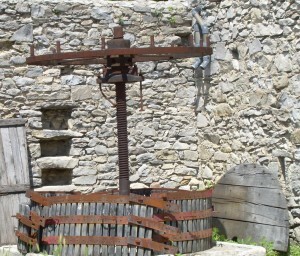 Pictured below is the big granite wheel, powered by a Moulin (windmill) and a giant water wheel, which crushes the olives and their pits. 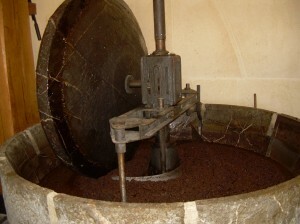 This can then be made into tapenade, or further pressed into olive oil by being loaded into bags and pressed with a giant weight-see the picture below as well. The open house was an excellent way to introduce me to what agro-tourism is all about. In one farm visit, there is honestly something for everyone. After today, I can definitely understand why French farmers would choose to follow an agro-tourism path and focus on niche production of quality versus commodity production of quantity. Even though agro-tourism farms exist in the U.S., I’m surprised they are not as popular as they are here in France. It seems a fantastic way to combat increased costs of production with low revenue, and international competition. At the open house, there was a greeting station where visitors could be welcomed to the farm and get an introduction to the various programs. The museum was open as previously described. 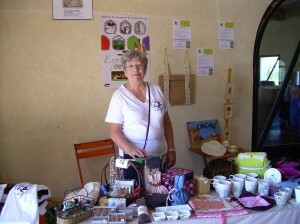 Local vineyards set up a wine tasting booth and there was also a craft booth selling terroir products, pictured below. 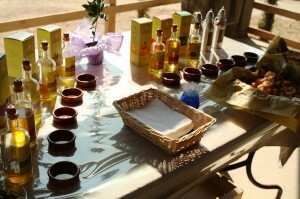 The store selling all of the olive products was also open as well, with guided tastings of the various oils. I was actually able to guide a tasting for English speaking tourists who wanted to explore the very strong tasting olive oil varieties. There was a scavenger hunt in a section of the olive grove for the kids, in addition to stations where they could color and paint with clay. 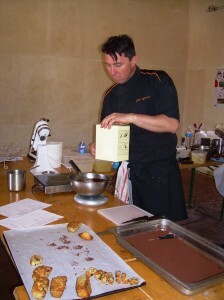 My favorite part, of course, in addition to the food tent where people could purchase gourmet lunches, wine, espresso, and ice cream to eat at tables located in the olive groves, was the patissier (pastry chef) who gave demonstrations on making delicious olive products. 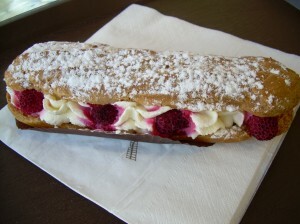 Did I mention I’m in love with French desserts? My stay at SupAgro University has certainly given me an in depth look into the French food labeling system, and today was excellent for going beyond the policy literature to see a real world example. We ventured out into the country in the Languedoc region to visit the goat farm of Jean Poudevigne and learn about, (and taste!) 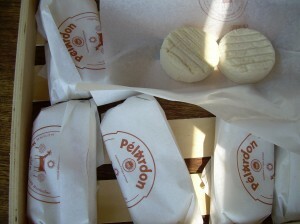 the renowned Pélardon cheese. 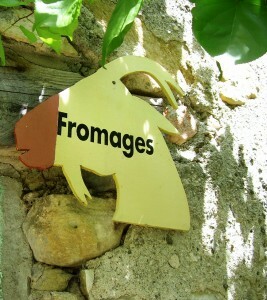 This cheese, pictured below, is marked with the AOP label which stands for Appellation d’Origine Protégée. 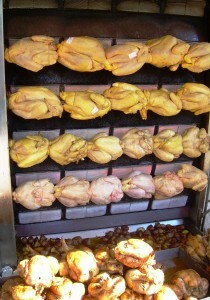 This means that the product is under very specific restrictions and the consumers know they are getting the real deal. The AOP is a label recognized on the European Union scale and is in the process of replacing the French AOC (Appellation d’Origine Contrôlée) label. Both labels ensure the geographic origins, the process, and the quality of a product. For example, the label guarantees that Pélardon cheese is “copyrighted”, it cannot be labeled as Pélardon anywhere else in the world except in Cevennes and Languedoc. 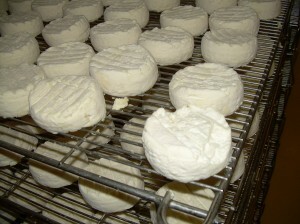 In addition to the location requirement, the cheese needs to be made with goat cheese, from an unfrozen curd, and aged at least 11 days to be considered Pélardon. We actually tasted the cheese throughout all steps of the aging process-a one day old cheese, a 12 day old cheese, now true Pélardon, and a 3 month old cheese, also Pélardon. 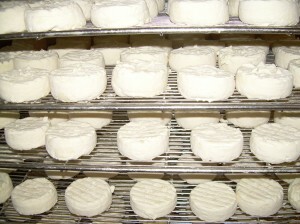 In the picture, the younger, very creamy, cheese is on the right. The 3 month old cheese, on the left, was quite strong for my tastes, but pairs well with the strong red wine of the Languedoc region. Jean Poudevigne pointed out that the stronger flavored cheese profiles of Pélardon are usually preferred by the older generations of southern France and by young girls-definitely interesting! It was also very interesting to discuss the producer’s take on the label regulations. Mr. Poudevigne agreed that the AOP label is totally worth the regulation hassle because it opens up the market for him, and allows producers to set similar prices for a specific quality. Marsden and Smith’s 2005 paper, “Ecological entrepreneurship: sustainable development in local communities through quality food production and local branding,” discusses existing sustainable operations are occasionally overlooked and not supported due to initiatives that support large scale sustainability policies. They also discussed the concept of sustainable value creation, where additional value is added to mainstream farm products through Agro-tourism, and the concept of ecological entrepreneurship where a farmer preserves cultural, ecology and environmental integrity, but find ways to obtain economic benefits. It seems to me that the French concept of the AOC label allows both sustainable value creation and ecological entrepreneurship to take place, is valuable for even a small scale producer, and is a very informative label for the consumer. Mr. Poudevigne discussed with us briefly how it is hard to supply the specialty cheese shops, local grocery stores, on site sales, market sales, and the supermarket with a high quality product on a year round basis. In order to do this, the farm has two sets of goats on different milking schedules throughout the year to ensure enough production. This was my first experience eating unpasteurized cheese, notice that I lived to tell about it, but unfortunately due to regulations, I will not be able to bring back any of my 11 day aged unpasteurized Pélardon. According to Mr. Poudevigne, unpasteurized cheese is better as it still has the good bacteria that helps keep the bad bacteria at bay-I’ll let the professionals debate that one… and in the meantime, will just enjoy the Pélardon and the desserts! I’m not sure I will have access to internet next week, so here is another post…Bonjour all once again from my France adventure! This past weekend we went to the large Saturday market here in Montpellier so all the pictures throughout this post will hopefully depict how fantastic the food is here and reinforce how important food quality is to the French. Today we met with Lucie Siriex, a research professor of Marketing and Consumer Behavior here at SupAgro University, to discuss environmental and ethical consumer concerns. I loved how she pointed out that the information we are learning is to not make us activists, but to widen our view about food systems. It seems that a lot of the food press today focuses on informing consumers what they should eat (organic, local etc) almost to a point that it is overwhelming and contradictory in many cases. Due to this, it was interesting to see data on how consumers interpret this overload of scientific and marketing information. The first question Lucie addressed was how to measure consumer ethical and environmental concerns. This can be studied by analyzing a consumer’s willingness to pay for a certain type of product, by direct questions, and by attitude and behavior scales. I really see value in experimental studies conducted by Siriex that actually give people money to spend and allow the consumer to buy whatever product they desire, because it is one thing to be idealistic and say that you are extremely concerned about food miles, but when you see a significant price increase between the local and conventional products, it is hard for many to act on their ideals. The second part of the presentation focused on explaining why consumers have certain ethical and environmental concerns. She uses a means-end chain theory to link product attributes to personal values to enhance understanding behind consumer motivations. For example, a consumer might not purchase organic products due to less pesticides because of their environmental impact, but more so, because the consumer values their family’s health. I would love to see research on this topic comparing the United States consumer values against what Siriex found as prevalent French values. Apparently, the French value the fact that their food tastes good, value food as enjoyment, are focused on health as a value, value when food evokes good memories, and have a respect for tradition. Consumers saw the fact that they do not need organic food to be able to enjoy their food. 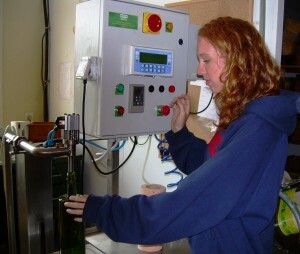 For example, in Siriex’s finding, consumers expressed that there really was not a need for organic wine because they already associated wine as “natural.” As demonstrated by an organic and fair trade chocolate tasting and bidding experiment , even though there is a interaction between taste and label, consumers definitely need to have quality before they are willing to pay more. I think values in the U.S. are not as focused on quality, but more on price and convenience factors, and not as centered on food as enjoyment , or as food as tradition other than on holidays. 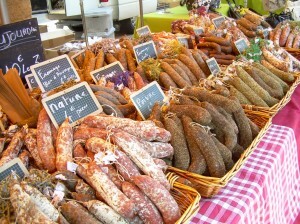 I’m continually finding here, depicted by the actual research statistics and the fact that everyone understandably makes the journey to the Saturday early morning market, that the French as a culture, definitely have a connection with their food like no other. 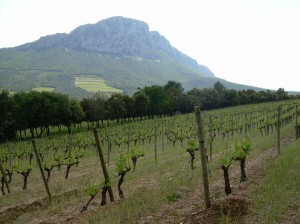 I am now in prime wine country located a little out of the city of Montpellier, in an area known as Pic Saint-Loup. This area is part of Languedoc, which the circle of land surrounding the Mediterranean Sea, and the landscape is referred to as the garrigue. All the grape vines are very short in my opinion compared to what little experience I have with grapes here United States from Horticulture 101, but I am told this shortness of the plants is to prevent breakage from the intense winds. 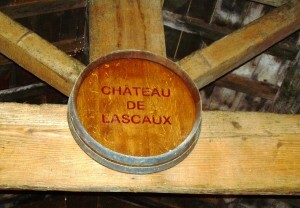 Our first stop was the Chateau de Lascaux, a 45 hectare vineyard that produces about 200 thousand bottles of wine each year. Lascaux means a limestone, stony soil and Pic refers to the hilly nature of the land which we were able to drive up and around on at the second winery l’Hortus. The landscape is absolutely gorgeous and is an important way to add value to the product, as the imagery surrounding the vineyards is crucial in constructing the consumer’s perception of the wine. 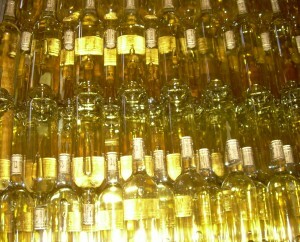 As pointed out by David Preston in a 2008 paper in The Journal of Wine Research, 40% more money is retained when the product is purchased on site. 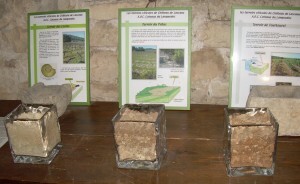 The owner of Chateau de Lascaux, Jean-Benoit Cavalier discussed the terroir of his vineyards by showing us soil samples(below), and detailing how it is important to use cultivation processes that work with your unique type of land. After spending this past fall semester taking soil science at Cornell, and focusing on the soils of upstate NY, it was definite culture shock to be introduced to this soil. Anyway, mostly red grapes are grown-Syrah, Grenache, and Mourvedre, but there are also some Vermentino, Roussanne, and Marsanne. 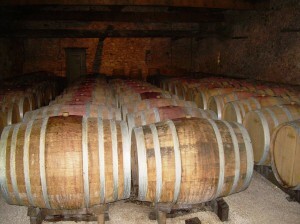 The barrels pictured below are oak of course. It was astounding for me to comprehend how old the operation is- the Chateau structure is from the 11th century. 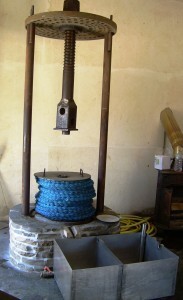 Below is a picture of an old press used in the winemaking process. The second winery, l’Hortus, is an estate of 5 partners that each have a separate role in the winemaking. 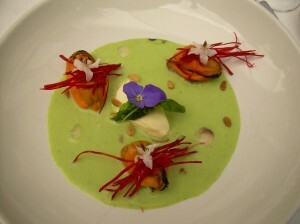 Our interview here at l’Hortus was fabulous for me in further enhancing my understanding of the concept terroir. In addition to terroir begin a certain location that makes your product unique, the definition can also be expanded and modernized to encompass how the product fits in to the global scheme. 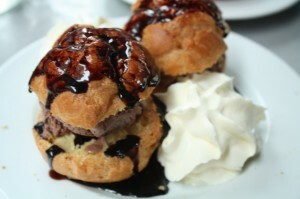 I’m off to connect with macaroons,but will discuss next time the researcher’s point of view, as we meet next with professor Lucie Siriex to learn about the new dynamics of consumers’ preferences. Bonjour! Greetings from the gorgeous south of France! 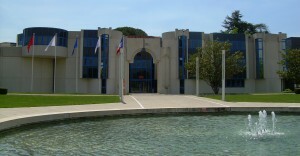 I am currently in the city of Montpellier studying at SupAgro University, an International Center for Higher Education in Agricultural Sciences. 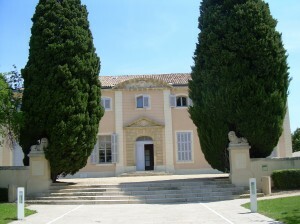 The plan is to immerse myself here for two weeks in value-added agriculture, known here as valeur differentes,through agro-tourism, and then spend the remainder of my summer at an olive farm called the Domaine de l’Oulivie. This is a definite hands-on learning experience as I will have a chance to meet individuals from the government position, from the research stance, and get a chance to meet and work with the producers themselves. So far, I am a week into this adventure and I’ve decided I am definitely in love with this area and its food. 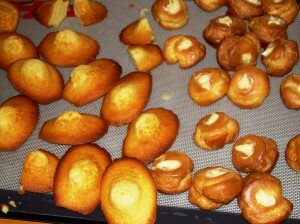 A friend from home dared me to attempt at least two new foods. I have had pickled seaweed and pork pate so far, in addition to numerous cheeses, some delicious and some rather rancid in my opinion, but French desserts have totally become my obsession. Anyway, as this is more of an academic blog rather than my personal food blog, or at least is supposed to be…I will discuss our first adventure, which was a meeting with Jean-Francois Pouget, Director of marketing and communication of Herault tourisme. Apparently after the French Revolution, a strong central government movement formed Departments, but this was later modernized to a system of Regions and Departments within France that are engaged in what appears to be a continual struggle somewhat like our Federal vs. State power issue (Thank you Food Law for a fabulous background of this!) In France, from a political standpoint, agriculture and tourism is covered by both the Department and the Region, and today we learned about the association within/of the Department that deals specifically with Herault tourisme. This concept is embodied in the fact that the French society has changed-going from traditional farmers to the point where people live in towns and cities and only 3% remain as farmers. 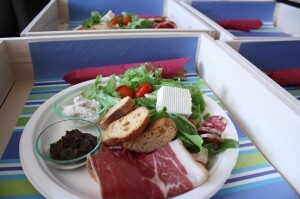 Herault tourismeis a way to capitalize on the movement to reconnect with food. French people have a desire to visit the countryside on their weekends off, and instead of going to the beach, they want to have an experience with their food and the people that produce it in the natural setting. This desire happens to be fantastic for the farmers from a value added sense because now they not only produce a product, but are able to market their way of life by visits and tours. The Department helps by providing funds to farmers and advice on marketing, while making political decisions and regulations from statistics on how to best preserve the countryside despite development for economic purposes. This is a really interesting concept cited in one of our readings as “re-embedding”, or blending ecological concepts into economic rationalities (Marsden 2004). Overall, the Herault tourisme Association/Department’s role reminded me in some parts of Cornell Cooperative Extension as their door is open for any farmer, but it also assumes some EPA-like power, and of course seems to have much more funding. It is completely possible for me to see why tourism is able to entwine itself with agriculture so well here because this area was literally built by wine. The beautiful buildings in the middle of the city-many built in the 8th century were financially feasible because of the wine production. This trend has persisted ever since then, below is a picture of a villa built from the riches from the wine trade in the 19th century. It sits in the middle of the Department buildings,pictured to the right, and serves to depict the history of the deep roots and development of the country. We are scheduled to tour two wineries in the Pic Saint Loup region next (providing we survive the drive…did I mention it’s impossible to find a car here that doesn’t have a least one major dent and several scrapes?) Until next time- a bientot!